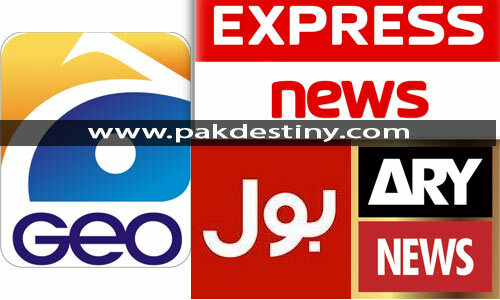 Islamabad, July 11 (www.pakdestiny.com) The BOL Media Network hits back and serves Rs 500 million legal notice on Geo\Jang Media Group for defaming it. It also has served a Rs 500 million notice each on Saleh Zaafir for writing a defamatory story for Jang and The News and the lawyer who filed a petition containing defamatory content against the BOL management. The BOL says it is ready to fight back and will give a befitting response to those who are targeting it especially the Geo Media Gruop on different forums. BOL says: “BOL is fighting a war not just for itself but, it is a struggle for every individual whose life is about to change with the arrival of BOL. For all those individuals connected with the media industry, especially journalists, who are suffering at the hands of the Saith culture prevalent in the industry; BOL is on a path-breaking mission to change the status-quo and bring about a positive change in the lives of all people in the media industry and Pakistan. BOL is setting a precedent that will revolutionize the Media Industry. Through its visionary leadership, the core objective behind BOL is the social and economic development of Pakistan. BOL is bringing the best practices to the media industry by providing Pakistan’s largest media infrastructure, efficient management systems to streamline processes, and most of all by offering an extravagant lifestyle and salary packages far above the industry average to its employees by sharing the fruits of its success. This has generated a wave of excitement all around the nation. The huge and overwhelming response is evident from more than 40,000 Job applications that we have received in a short span of less than a month. Moreover, we have also received an encouraging feedback from media professionals and the general public, including best wishes and prayers, as well as positive responses to BOL Network’s branding, identity, leadership, team, careers, and advertising opportunities. However, the great response we got gave a small and insignificant media group many sleepless nights, prompting them to sabotage our noble mission to revolutionize the media industry in Pakistan, through coercive and unethical ways. And the reason behind this defamation campaign is clear: BOL Network managed to attract a large number of its employees , which added to its insecurity to such a degree that it mounted a well-orchestrated smear campaign against the upcoming channel. It is a pity that they have gone down to this point and have admitted their failure way before playing a healthy role in the competition. However, BOL will not be deterred by these unscrupulous elements seeking to undermine our strengths. First of all these elements used various platforms to defame BOL such as SMSs, emails and blogs. BOL has examined all forensic evidence and knows the identities of these perpetrators. We will bring them to justice and reveal their identities in front of the nation. BOL assures all our stakeholders, especially the general public, that we will continue to lead this fight against all such negative elements. BOL will remain steadfast and protect its noble cause for the benefit of everyone in the media industry. In this context, Mr. Faisal Sherjaan working as a director for the Geo/Jang Group which is in direct competition with BOL, bears a mention here. He claims that his organization has nothing to do with his actions and has started a malicious campaign on social media to defame BOL. BOL has taken him to task and has obtained a restraining order against him from Sindh High Court. We have filed suit of damages Rs. 500 Million and also initiated criminal and civil proceedings. After this, a frivolous petition was filed against BOL by Mr. Agha Shahid Rasheed, a former PTV employee, in Lahore High Court which was disposed off immediately by the Honorable High Court on the very first day. Subsequent to this, BOL began to pursue civil and criminal action against the petitioner for filing false and defamatory pleadings in the court. Then there were direct attempts to misguide the government functionaries to create legal problems in the operations of BOL however, all such attempts failed. Then out of frustration a false and baseless story was written by Mr. Saleh Zaafir (who is one of the biggest recipients of secret fund as per the list released by the Supreme Court). This was a totally false, baseless, incoherent story based on a non-existent court order thus not only liable for criminal and civil proceedings under the defamation ordinance 2002 but also for criminal blackmailing, qazaf, contempt of court and for falsifying the court order to accomplish malicious objectives thus hurting the sanctity and respect of the Honorable courts. 1. Law & Justice must prevail.